When writing novels I will write science fantasy or paranormal fantasy. With my SHORT STORIES I can swing between the literary and the EXPERIMENTAL, but they've always got some element of the fantastical or dark. WHAT KIND OF STORIES WILL YOU FIND HERE? I'm fascinated by dystopian stories, of a future that could one day be our world. I pursue tales of conspiracy and paranoia. My favourite kind of story is that of a quandary, when forced to choose between two or more horrible outcomes. I adore TWISTS and RED HERRINGS, I often use foreshadow in both subtle and extreme ways, and I love to build tension, either the mysterious or romantic kind. I like a good vampire story, but not zombies, they're scary. I used to write HORROR but even then those stories were more speculative than gory. If you geek out over multiverses, portals, gritty reality, conspiracies, ulterior motives and powers that are just as much a curse as a blessing, I recommend you read the WANDERER OF WORLDS book series. It's contemporary, gritty and expansive. 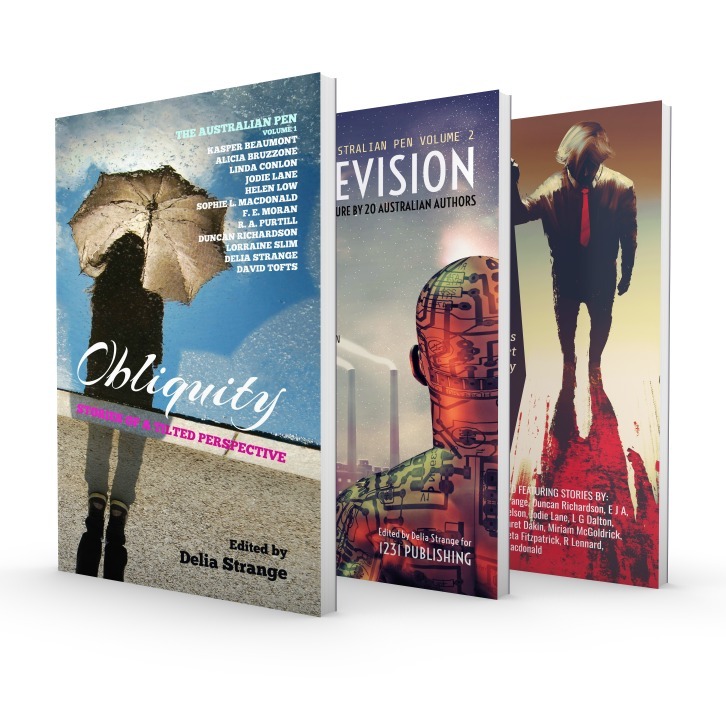 If the idea of taking time out of your busy schedule sounds too difficult (TL;DR) and you prefer to read your stories in smaller chunks, then I shall point you towards BLUE SHIFT, OBLIQUITY and FUTUREVISION. After something softer? With a touch of futurism and idealism, and a little bit lighter? Then FEMME : Light is for you. It follows the story of a young woman from Earth who travels in a portal to the world of Femme -- a world that reveres her gender. Daeson and Synjan are fleeing the Hunter sent after them by the Authorities. They are able to shift from world to world but the Hunter is an experienced tracker with exceptional resources. With multiple characters working both with and against them, the Wanderer of Worlds book series is a complex contemporary fantasy that challenges both protagonist and antagonist at every turn. Kaley Blackburn is a sheltered young woman sent by her University to the world of Femme. Whilst there, she is awestruck by the magnificence of the futuristic world but is confronted by the culture of slavery, when she is assigned a man named Mecca to assist her for the duration of her stay. When the lights come, unplug everything. Featuring the 'Second Life' novella with extra bonus short stories. UFOs, damning prophecies, evil laboratories and persistent madness resides here - all with a science fiction or speculative twist. Ben Samson has an obsessive desire to become a vampire and is spoilt for choice between two sires. Lazarus and Kerr are unequivocal opposites. At first Ben's preference is clear but the more he discovers, the more he doubts his instincts. He doesn't want to spend immortality with a connection to the wrong man. Get a free e-book for signing up. Which one? It's just random. Sign up for the newsletter I fully intend on one day sending out monthly-ish*. It's in limbo at the moment. Every newsletter will have a short story in it or a link to one. Also, if there are specials, discount days, freebies and new releases, I'll put them in here too. As the header says, you will get a free e-book for signing up - either Femme: Light or Wanderer of Worlds 1: Axiom or Blue Shift. If you are keen on a particular one, you can use the drop-down box with the signup to put in a request. * Once a month or less, never more often.